When I was preparing for the previous week’s class on sundials, one of the dialists on the North American Sundial Society site included a link on his website for Jon Leslie’s gallery of paper models of real and fictional spacecraft! Imagine my delight when I stumbled upon Joy Cohn’s geodesic sphere model of the Chronosphere from the science fiction television series, 7 Days. From the information Joy provided with her model, I learned that 7 Days was based around the premise of time travel. Since the geodesic design of the Chronosphere linked up with our study of geodesic domes, and time travel linked up with our study of sundials, how could I resist turning the Cool After School crowd loose on this project? With my laptop, we explored ancient Rome, Mars, and the Moon on Google Earth. Then the kids and their parents worked on making their Chronosphere models, which were much harder than our earlier geodesic dome model (as the sphere nears completion, it becomes harder and harder to get your hand inside). But, despite the difficulty, they persevered and constructed beautiful models. May they guide their ships into the far reaches of their imaginations! 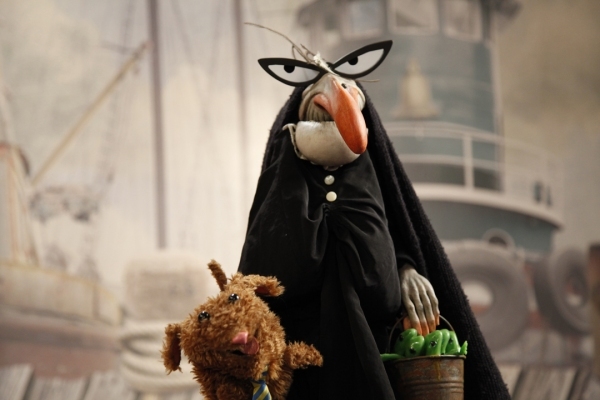 Somehow I had never told the story (in song) of The Little Old Lady Who Swallowed a Fly. When the idea finally occurred to me, I immediately envisioned a life-sized Old Lady puppet who could gulp everything down. When I started discussing with Stuart how the puppet should be constructed, he was seized with a fit of creativity. I came home from work and discovered that he had built a marvelous puppet using part of a Quikrete Quik-Tube building form left over from a fence repair project. Her jaw shuts with a very unsettling SNAP! I provided her blue hair and clothing, plus most of the animals she was to swallow. Thanks to her collection of Beanie Babies, my friend Gail was able to contribute a very funny little pug dog, and Stuart saved the day once again by making a large cardboard cutout of a cow. I suspended the Old Lady by her neck from the stand for our projection screen (which remained nicely out of view), and draped her skirt over my puppet theater. The Old Lady’s overskirt could be parted to reveal a view of the contents of her stomach, which swirled around like clothes in a washing machine. Most of the kids and their parents knew the song, and joined in enthusiastically! For our craft, we made paper bag puppets. Instead of making them the usual way (using the bottom of the bag as the head), we attached the Old Lady’s head and dress to the front of the bag, which was left open at the top. Before attaching her head, we cut away the portion of the bag behind her open mouth. Using cardstock, I made a rainbow-colored set of simple drawings of the animals the Old Lady swallows (identical to the ones on the puppet’s stomach spinner), which could be inserted through her mouth. Check out this array of sinister Old Ladies! Since the spring equinox was approaching, I decided that it would be fun to make sundials for our March 16 Cool After School program. I remembered, from an exhibit I worked on at the University of Texas a few years back, that the North American Sundial Society has a very interesting and informative website. Sure enough, I found a whole section devoted to sundial construction, complete with instructions and templates. We made two different models: the Universal Ring Sundial, by Wee-Meng Lee of Singapore, and the CD Sundial by the Canadian dialist, Carl Sabanski. We used the Find Latitude and Longitude website to calibrate our sundials to our location at the Tony Hillerman Library in Albuquerque, New Mexico. Fortunately, it was a sunny day, although the wind was a bit of a problem. Check out our cool sundials, which actually worked! Robots were the theme for our Page Presents class this week, which featured the puppet play, “Take Me to Your Library,” from One-Person Puppet Plays, by Denise Anton Wright. I updated the story quite a lot, and my space alien was a ROBOT space alien named Robo, from the planet Robozoid. The play began with a flying saucer (pie plate) flying over the puppet theatre and landing behind the scenes. There was a lot of offstage beeping, which added to the suspense. The kids played right along with the interactive script, and when Rabbit asked them about the strange beeping noises he had been hearing, they reported gleefully that there was a robot alien. Of course he did not believe them. Naturally, they loved it when he later confessed, “You were right about that robot space alien!! !” And, rather than handing over his library books to the demanding Robozoid tourist, Rabbit took Robo along to the library to experience its wonders for himself (including the fabulous Ms. V). At that point I appeared as myself and convinced Robo to take downloadable digital books back to Robozoid and leave the physical books (checked out to Rabbit) on Earth. And the flying saucer zoomed off into outer space to the sounds of cheering and applause. Afterwards the kids had a blast making Robot bodi-puppets. The beautiful letters and numbers come from pages I recycled from last year’s Stendig wall calendar. Discarded CDs, a space blanket, wrapping paper tubes covered with aluminum foil, and transparent iridescent gift wrap were also featured. The dancing Robot children made me keep playing it again and again. On Saturday I repeated the puppet play for my Music and Movement class, and this time I added Daft Punk’s “Technologic” and A. R. Rahman’s “Jai Ho” to the robot dance party playlist! I know I do! I have to confess that the very cool poster for Teen Tech Week sent me into robot mania. I made an awesome animatronic robot hand to show off to the Cool After School crowd. Of course they loved it, but I had discovered that building it required a long, highly focused attention span, so it was a bit beyond the scope of what we could accomplish in our 2-hour class. I showed them some videos of even more awesome robotic hands. …and the Cool After School engineers created their very own out-of-this-world robots! Who knew that the stuff I cleaned out of my junk drawers could look so good? And so high tech?? It was the week for paper architecture! After making paper geodesic domes on Wednesday, we made origami pagodas on Saturday at our monthly Origami Cool Zone. My friend Dawn Jackson suggested this model, and it is a great modular project. It’s fairly easy, and the units fit together very sturdily to make an elegant structure. It would be fun to make a set of origami dolls for the Japanese Doll Festival and have this pagoda as a backdrop. Since it’s approaching the time for the Wearin’ o’ the Green, Dawn also taught everyone how to fold an origami shamrock. 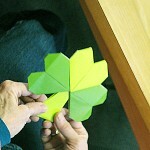 This model can also become a four-leaf clover. As always, everyone had fun learning something new! I remember loving the story of The Three Billy Goats Gruff when I was very young…and I still do! I made puppets of the Billy Goats Gruff out of paper plates with fiberfill for fleece and legs made out of cardboard tubes or clothespins. Stuart came up with an ingenious system for attaching the legs, and it works really well. Last year I played the part of the Troll, wearing a really warty green mask that Stuart had made from a paper plate, but this year I wanted to use my puppet stage and I knew the warts couldn’t withstand passage through the curtain. I covered my puppet stage with camouflage fabric and fake greenery, and then I placed one of our small tuffets on each side of the stage. One was lightly covered with a mossy green fabric, while the one on the opposite side was covered with lush green leaves. Each of the Billy Goats Gruff gazed longingly at the greener-on-the-other-side field across the river before deciding to cross the bridge. It was a grand story. Afterwards, the kids made billy goat masks and practiced capering and trip-trapping around the children’s library. And the three Billy Goats Gruff lived happily ever after in the green field. Cool After School: More Domes! Domes were such a hit last week, I decided to spend another week exploring domes. I showed short clips from the video, Building Big: Domes, including the Pantheon and Buckminster Fuller’s geodesic domes. Then we constructed our own paper sculpture geodesic dome models. I found a cool website: Domebook: How to Construct Cardboard Play-Domes. It includes printable scale models, and we built the 3 frequency 5/8 sphere Icosahedron. At the end, the kids built a tower out of foam blocks and crowned it with a dome. They crammed a large teddy bear into this imposing lair. I happened to glance over at them when they were occupied with this stuffing process, and I couldn’t help but think of the Mad Hatter and the March Hare trying to stuff the Dormouse into the teapot. Since we were focusing on Buckminster Fuller’s work, I also printed out his Dymaxion map, which folds into an icosahedron. Fuller pointed out that his map had “no right way up.” When unpeeled one way, one sees all of the continents in an almost contiguous land mass, while a different unpeeling reveals a globe of oceans surrounded by land. Check out this cool animation from Wikimedia Commons!